By David Ponce on 05/20/15 • Leave a comment! We love TokyoFlash, and have featured their watches many times over the years. The Limited-Edition Breathalyzer Watch featured in today’s deal post happens to be able to do more than just tell time: it also tells you how drunk you are! The days of wearing a watch to simply know the time are far behind us. With the TokyoFlash Breathalyzer Watch, you can tell the time, check the date, set alarms, and last but not least, measure your blood alcohol content level. Discreetly blow into the watch to see which of the 10 preset levels of intoxication you fall into, or play the built-in sobriety game for the ultimate ice breaker. Normally costing $109, with today’s deal the watch is only $79.99. By David Ponce on 06/20/13 • Leave a comment! It used to be that Tokyoflash watches got conversations started thanks to their unusual way of telling the time. Now you can add another potentially useful feature: measuring your blood alcohol content. The Kisai Intoxicated has a port on the side which when blown upon for 5 seconds, registers the amount of libations in your breath and informs you of the results. Granted, they’re not incredibly accurate, giving results in 0.02mg/L tiers, but it should be enough to tell you whether you’re just a little buzzed or altogether drunk. We suggest not taking any chances if you’re hovering near the legal limit, since the margin of error could potentially lead you to false negatives, but as a general indicator of sobriety, it’ll do in a pinch. Aside from that ability, the watch fits in with other timepieces from the company with an original (if not altogether difficult) timetelling design. It’s $99, and due to heightened demand, is currently on pre-order, with shipping slated for July 1st. By David Ponce on 05/02/13 • Leave a comment! It’s been a while since we’ve covered our favourite watchmaker, so we’re pleased to announce the Kisai Rogue Wood, from Tokyoflash. 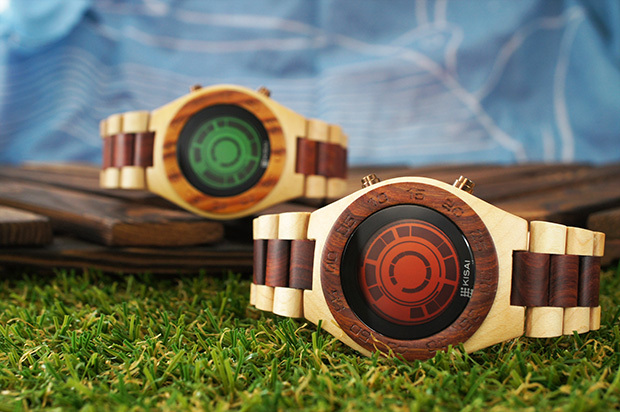 It combines one of their trademark initially-hard-to-read time-telling watchfaces, with a rather distinctive looking wooden wristband and case. The case and strap have been carefully made from a combination of 100% natural maple and sandal wood, meaning each watch has a unique wood-grained finish. A clear coating has been applied to the wood for protection. The lens is made of mineral crystal and links that make up the strap are individually made so the strap can be adjusted like a normal watch to fit your wrist perfectly. We think they look rather good, and unlike some of their other designs, it’s not so hard to tell the time with this one. Just refer to the image below. The watches are $99 for the next 25 hours. By David Ponce on 11/29/12 • Leave a comment! Our love for Tokyoflash watches hasn’t necessarily waned, but we have to recognize that not all are created equal, which is why we don’t cover every single launch. But we like the Kisai Polygon above. It harkens back to the company’s obtuse time-telling schemes, though once you’ve figured out how it works, it’s actually really simple. Yeah, we realize that that particular explanation (or even our attempt) may not be enough to get you to see it right away. But really, it’s like those stereograms that pop out of page once you look at them right. Which is the beauty of the Kisai Polygon in our opinion. Still, hit the jump for a graphic that could help clear things up a bit. By Hazel Chua on 10/19/12 • Leave a comment! This watch might just give you a headache whenever you glance at it to check what time it is, but it sure is a looker in more ways than one. Tokyoflash is known for their quirky and out-of-this-world watch designs and concepts. 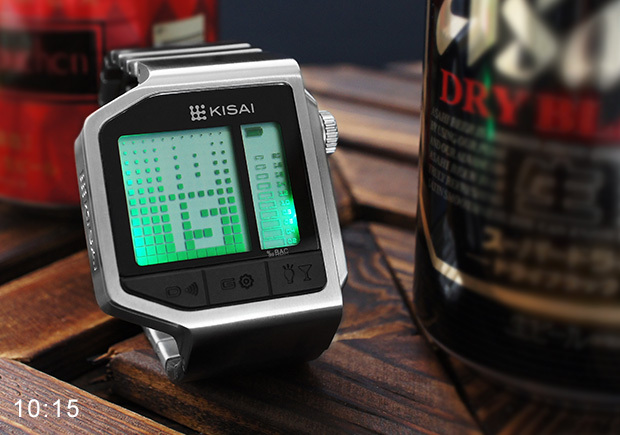 However, the Kisai Maze happens to be an actual product and it’s as outlandish as watches can get. 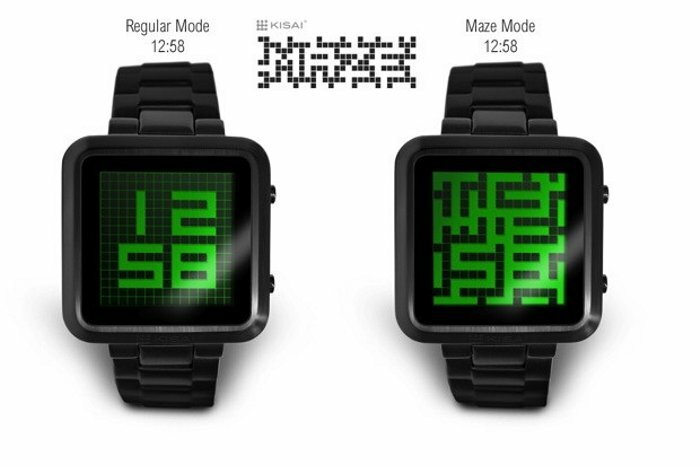 The watch’s LCD display doesn’t show you the time, but it features a maze instead. You don’t have to navigate through it or anything, though you’ll have to learn how to read the pathways right so you can get the time. Of course, you can just switch back to the regular digital display if you’re strapped for time, but where’s the fun in that? 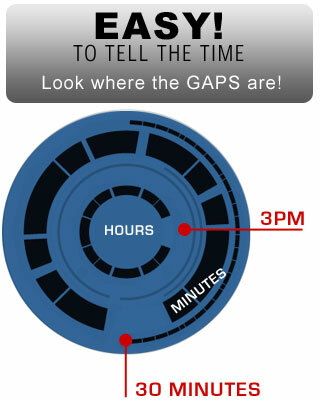 Hit the break for a video showing the watch off, followed by links on where you can get it. By David Ponce on 09/05/12 • Leave a comment! It comes in two strap and four LCD colours. The Kisai Zone is currently $99 for the next 26 hours, and will go up to $139 afterwards. By David Ponce on 07/12/12 • Leave a comment! 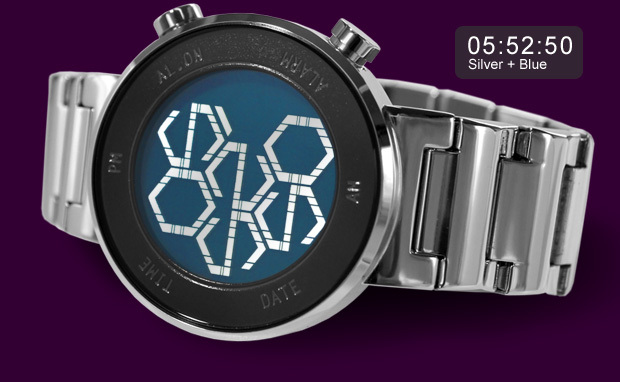 TokyoFlash, our favourite geeky, obtuse-timetelling watchmakers, have released yet another watch. 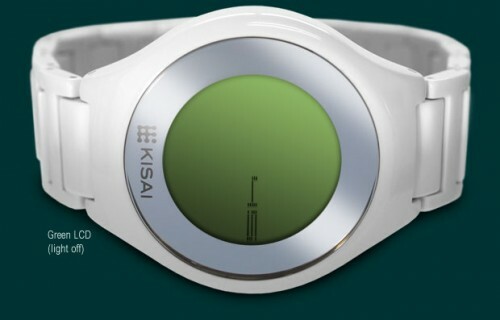 This one is called Kisai Online, and features an accelerometer which is used to reveal the time. When your arm is down or doing anything but pointing the watch towards you, the face of the watch looks like nothing but a bunch of squiggly lines. But when you want to know what time it is, just turn it towards your face and parts of those lines will fall away to reveal digits. They’re fairly easy to read, though they do require a little getting used to. Press a button and the date appears; press it again and the alarm time shows up. 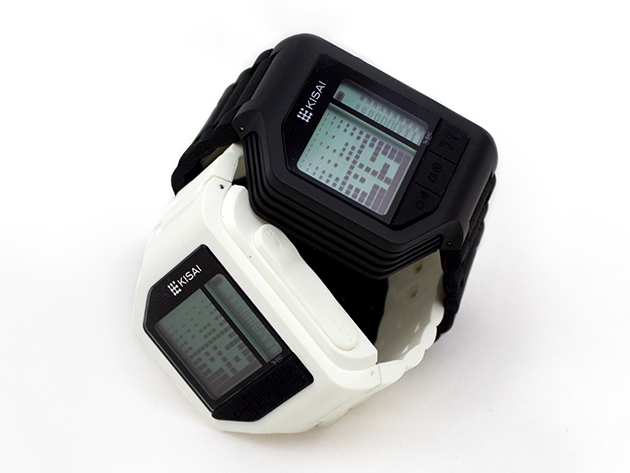 The watch is available in two colours of band (black and silver) and three colours of LCD (blue, red or natural). It’s $149 for the next 37hours, after which it’ll go up to $169. By David Ponce on 05/09/12 • Leave a comment! 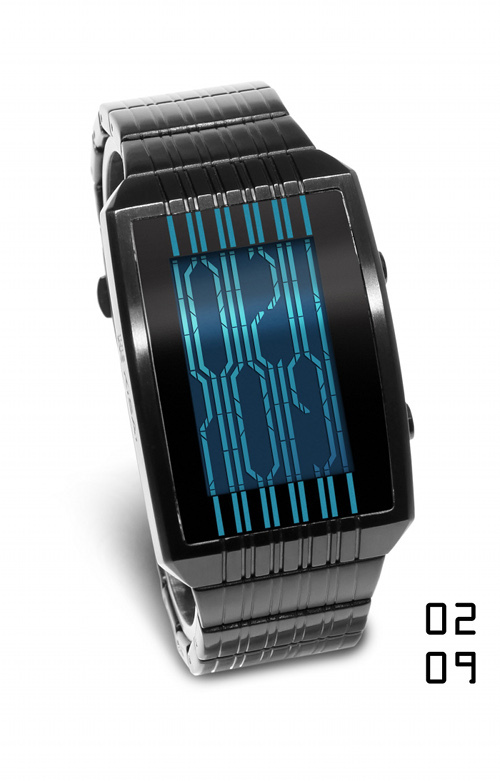 You know we like us some Tokyoflash watches, with their obtuse time telling schemes and bright designs. We make a point to report on every new release and we’re pleased to announce Kisai Uzumaki, the sixth concept from a fan to become reality. Unlike most of the company’s watches however, this one doesn’t make it too hard to tell what time it is, instead focusing on its appearance. 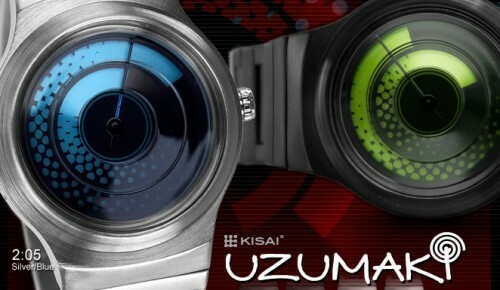 Uzumaki means whirlpool in Japanese and the timepiece aesthetic cues all revolve around this. Particularly striking is the “custom made acrylic lens, designed with concentric circles that descend from the edge of the case into the centre of the watch to create the appearance of a whirlpool.” Time is told simply, like a regular analog watch, with the hours on the outside and the minutes on the inside. The rotating hand indicates the seconds, for precise time telling. It’s $99 for the next 44 hours, after which it goes up to $129. By David Ponce on 03/29/12 • Leave a comment! Another week, another design by Tokyoflash. This time it’s the fourth user-submitted concept to be made into a full watch. It’s called Kisai On Air Acetate and features a clean and minimal design that is somewhat a departure from the company’s flashier offerings. The way in which the time is read however is still somewhat novel, with the minutes and hours represented on the same “hand”; the position of the hand gives you the hour while the hand itself is made up of the minutes. The time on the picture above is 3:45. 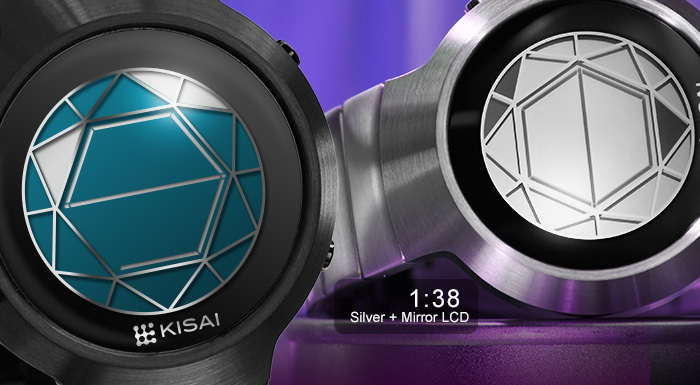 Kisai On Air Acetate features touch screen technology and displays the time and date. It also has an alarm mode and animation. The touch screen display has four hot-zones (top, bottom, left, right) which you can simply touch with your finger to change mode; time, date, alarm, light up. Holding your finger in place for a few seconds allows you to customise; hold your finger over the alarm zone to set the alarm, hold it over the time zone to set the time. It’s intuitive, simple and fun to operate. For the next 43 hours, shipping is free and the watch is $139, after which it’ll go back up to $159.